Many thought that the Trail Blazers might fold after losing C.J. McCollum and then Jusuf Nurkic as well, but the team was able to fill each void and soldier on. While McCollum is back, it is unclear how much he will be able to play right off the bat. Despite the injuries, they have managed to continue to play well. Down the stretch, they won eight of their last ten (including their last three in a row) and 12 of their last fifteen. Since March 1, they have been one of the more productive offenses in the game (117.2 points/game). However, against a team with the potential to explode on offense like the Oklahoma City Thunder, they are going to need to pick up their defensive game. On the season they ranked 16th with a rating of 110.9. When you have a talent like Russell Westbrook on the roster, there is always going to be the chance he’ll explode on offense and just take over the game. Add in another talented offensive player in Paul George, and you have one of the scariest tandems in the NBA. However, while they did play better in their second season together, we may not get a chance to see how good they can really be until next season. But as far as this season goes, George played well enough to be a legitimate MVP candidate. For averaging a triple-double for the third year in a row, Westbrook should have been one. But their problem heading into the playoffs will be two-fold. Is George’s shoulder okay? Will he hold up? Also—is there anyone that can step up when Westbrook and/or George struggle to get on track? Prediction: Portland has done an admirable job after losing two important players to injuries. But the Thunder have more talent on their roster and are far more explosive. Oklahoma City swept their regular season series but will not do so here. 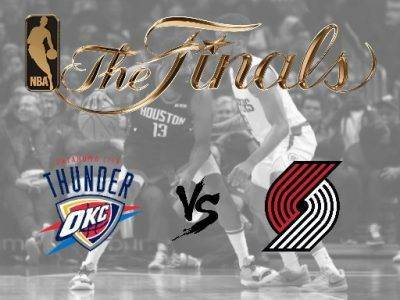 The Thunder will win the series, though, 4-3.